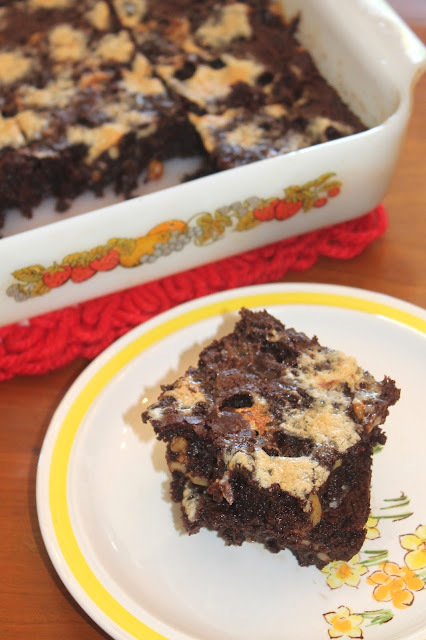 Sadly, today is my last post for the Secret Recipe Club because it is ending this month. I've enjoyed participating in it so much! I love making something from someone's blog and I really love seeing the recipe someone picked from mine. It also helped keep me motivated to post after having the babies. I will miss it a lot. For my last post, I was assigned to make a recipe from Our Eating Habits. This blog is written by Jamie who loves her family, Christmas, Disney, and, of course, food. While looking through her blog, I was looking for a Thanksgiving appropriate recipe and was tempted to make her Chocolate Chip Pecan Pie (still am a little! ), Cranberry Cornbread, and Rosemary Au Gratin Potatoes. I ended up choosing her Sour Cream Cranberry Bars. I chose these because I think cranberries are so underutilized outside of juice and cranberry sauce at Thanksgiving dinner. I love to use them in recipes. I also thought these bars would make a nice non-pie Thanksgiving dessert and also a nice Christmas dessert to add to your cookie tray. Plus since I made Sour Cream Apple Pie, I'm really loving desserts with sour cream in them. The recipe below I modified just slightly. 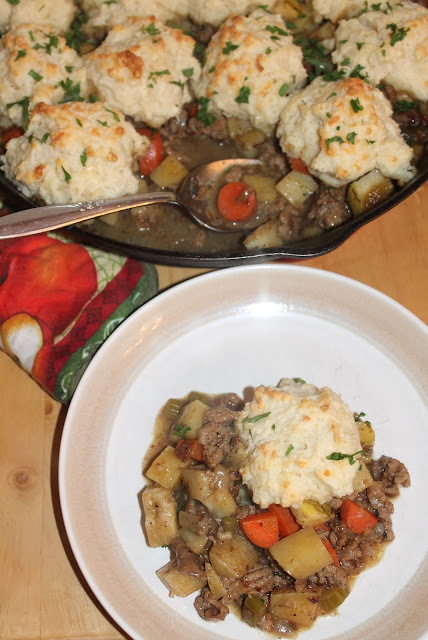 This meal is full-on autumn comfort food at its best! 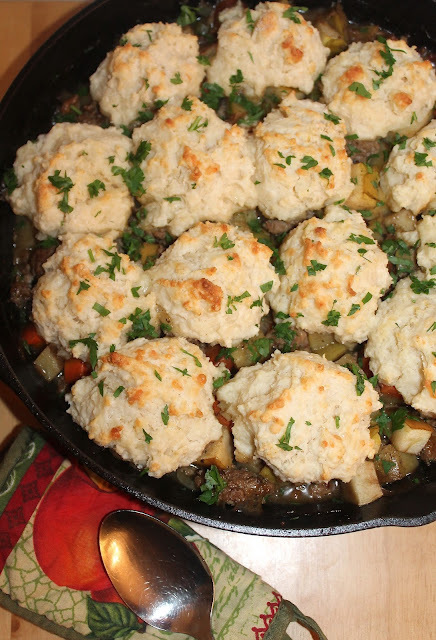 Turkey, apples, and vegetables in a cider gravy all topped with light and buttery cheddar biscuits and baked until golden and bubbly. It has easily become a new favorite of ours. This recipe is a modified version of a similar dish in one of my favorites books: Apples of Uncommon Character: Heirlooms, Modern Classics, & Little-known Wonders. It's not a cookbook, but a beautiful book all about apples that also has 20 apple recipes in the back. I sometimes dream of living on an apple orchard one day and have a bit of an obsession with all the different varieties and with apple recipes. This dish is delicious as is, but I think different vegetables would also work very well such as replacing the celery with celery root, replacing the potato with turnip or rutabaga, or even adding a bit of cubed winter squash like butternut. This recipe will serve about four to five people. This month the Secret Recipe Club is having a special Fall Dishes reveal! While pumpkin and apple are generally thought of as the ultimate fall stars (and of course I love them both as you can tell from a quick browse through my blog), I also love to highlight autumn vegetables like other winter squashes, root vegetables, and Brassicas like cabbage. I really enjoy harvest time and all of the terrific vegetables that come out of gardens in September-October in our region. I happen to really love red cabbage in particular. I think it's so pretty and it adds such a colorful punch to any meal. When I saw this recipe on Dessert Before Dinner's blog, I knew this was one I wanted to try. I have another sweet and sour red cabbage recipe that is my go-to, but I really liked the use of caraway as well as onions and garlic in Stephanie's recipe. We had this dish when my mom was over for dinner and we all enjoyed it a lot. We served it along with some German brats, pierogi, and applesauce. It was a perfect fall meal! Below is my slightly modified recipe. I have previously had Stephanie's blog for Secret Recipe Club and said if I ever had her blog again I was going to make some of her sourdough recipes. However, during the move and my difficult pregnancy, my sourdough started died.... So I have to start a new one soon to try out these doughnuts! 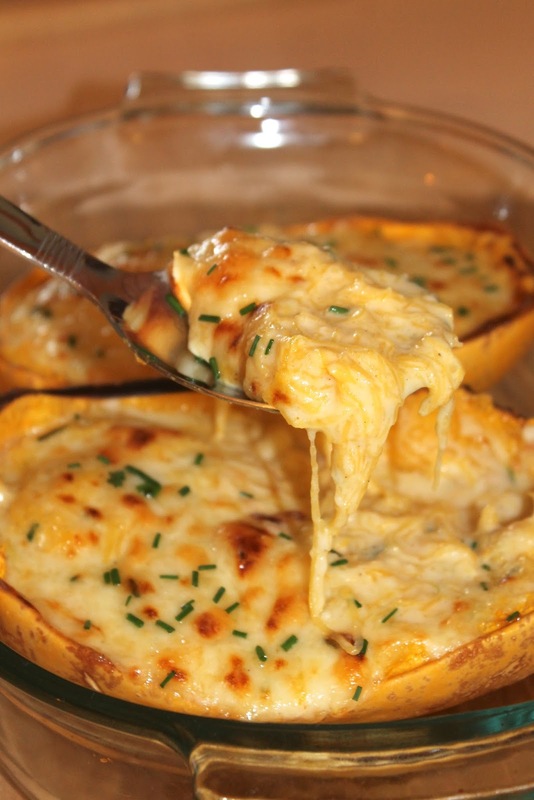 They also would be a great fall recipe with a glass of apple cider. 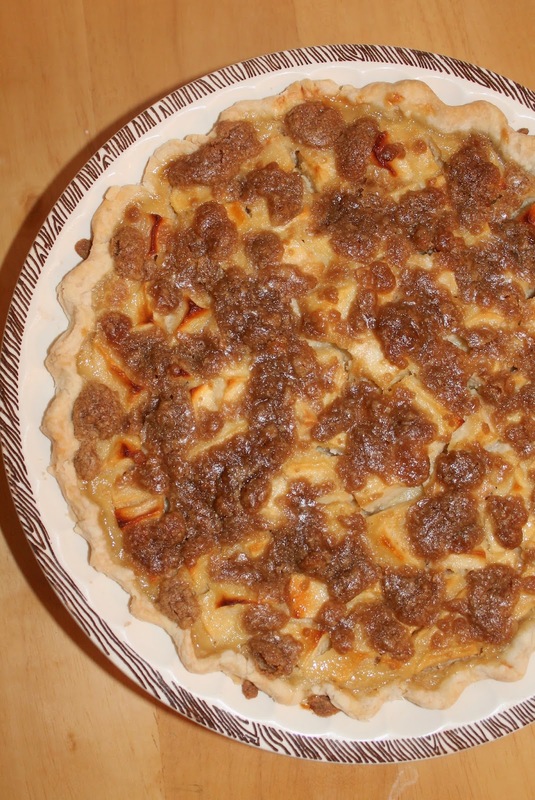 Apple pie is taken to the next level with this recipe! 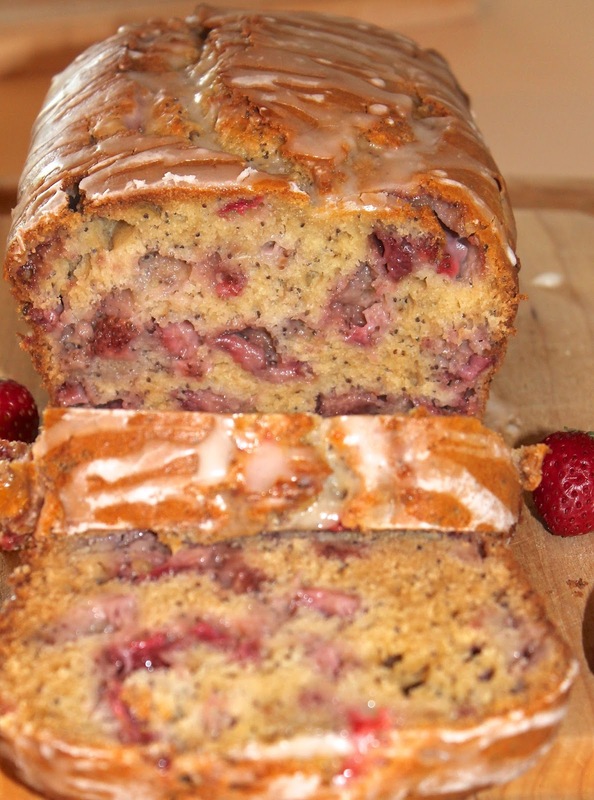 I saw this recipe on Taste of Home's website and have had it pinned to make for a while now. I finally had some time to make it and am glad I finally did. 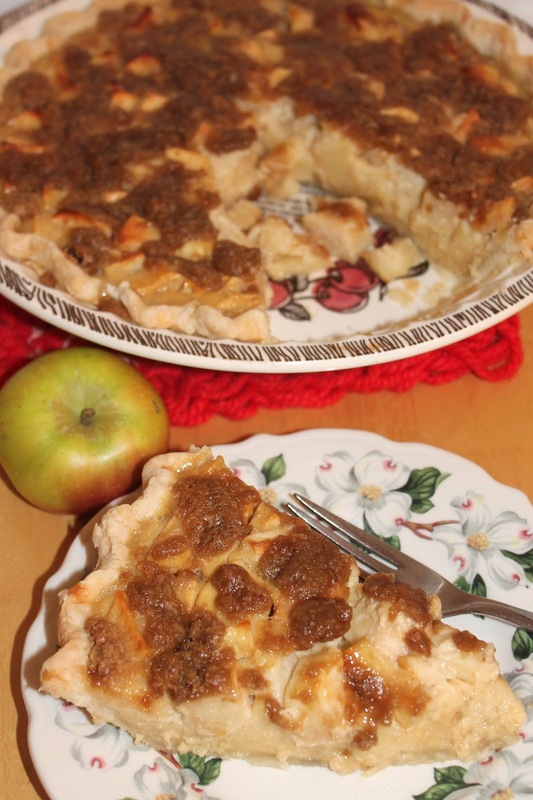 The use of sour cream in this pie adds a nice touch of tang with the sour apples, but the sugar and brown sugar topping help to still make it sweet - a perfect contrast in flavors. Another thing I love about this pie is that it is free of spices. As much as like cinnamon, ginger, and nutmeg with apples, it's nice to have a dessert where the flavor of the apple itself really shines through and is the star. Of course we went on our annual apple picking trip this year so we have a bushel of apples waiting to be used. I try to make at least one new apple recipe each fall because apples are a big deal in western New York and for me they are one of the best flavors of autumn. Plus we always have a bunch to use up! The babies are beginning to sleep better. They are almost 3 months old now! I'm starting to not be as much of a sleep-deprived zombie most days now and am having a little more ambition and time to cook and bake again. It's still hard, but I try because we like to have good food haha. Some days though it ends up being frozen chicken strips and waffle fries, and that's okay (I cut up some celery to make me feel a little better haha). It's time for October's Secret Recipe Club reveal! This month I was assigned to make a recipe from My Wholefood Family. This blog is written by Susan who lives all the way over in Australia. She is a mom of three and focuses on creating recipes from real, whole foods. I found a lot of interesting and tasty recipes on her blog like these Sweet Potato Brownies and Sesame Chicken with Ginger Rice (the rice sounds fantastic). 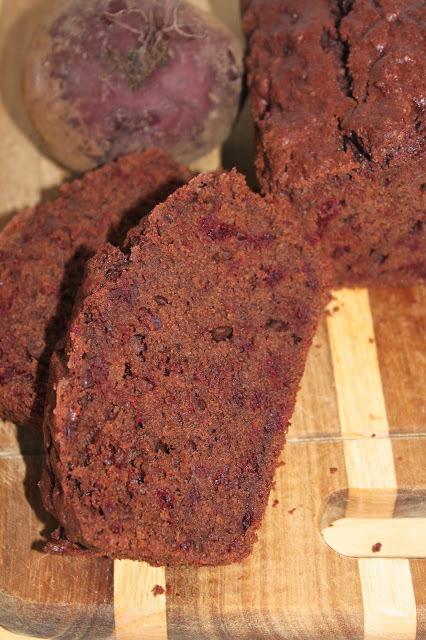 I ended up choosing her Chocolate Beetroot Cake because it sounded so intriguing and also because I thought the mixture of the dark chocolate color with flecks of red would be a fun treat for Halloween time. I adjusted the recipe slightly for my more American way of measuring (though I did measure out my chocolate in grams!) and cooking and I also used regular flour and sugar in my version. You can see Susan's original recipe at the link. I used Susan's suggestion of also replacing a bit of the flour with cocoa powder and was really happy with the results. This cake is very chocolaty but also has the very earthy taste from the beets. It's a unique cake that I'd make again in the future. It's October! October and November are my favorite months of the year. I love fall and the food and holidays of fall the most. Every fall (usually the first weekend of October), we go on a family apple picking outing to Lynoaken Farms. We love this farm because they have all sorts of heritage apple varieties growing in their orchard so you can try all kinds of apples you'd never find in a grocery store. They also have all the popular favorites, too. This year my husband and I each wore a baby in a carrier while we picked. We were a little nervous as this was the first long outing we've done with the twins, but it went well! Each year when we go apple picking, I make up a large batch of cookies to have for our after apple picking snack. I've made these and these a few times, but this year I wanted to take something new. I like to make a fall themed cookie, and one that isn't apple since I don't want to have to buy apples right before going to pick a bushel. 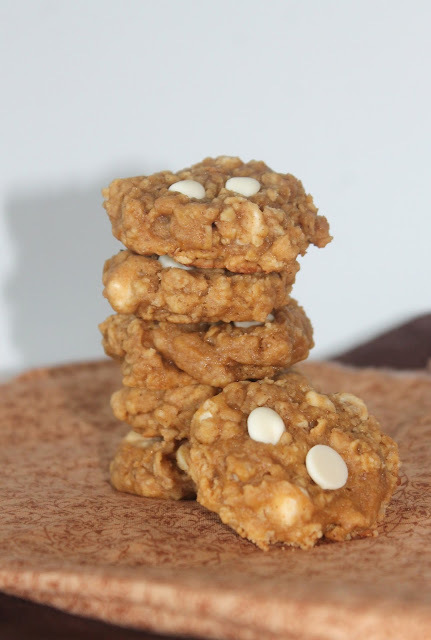 This year, we had these pumpkin oatmeal cookies with white chocolate chips in them. This recipe will make about 6 dozen small cookies. I like them on the smaller side since we have many people eating them. 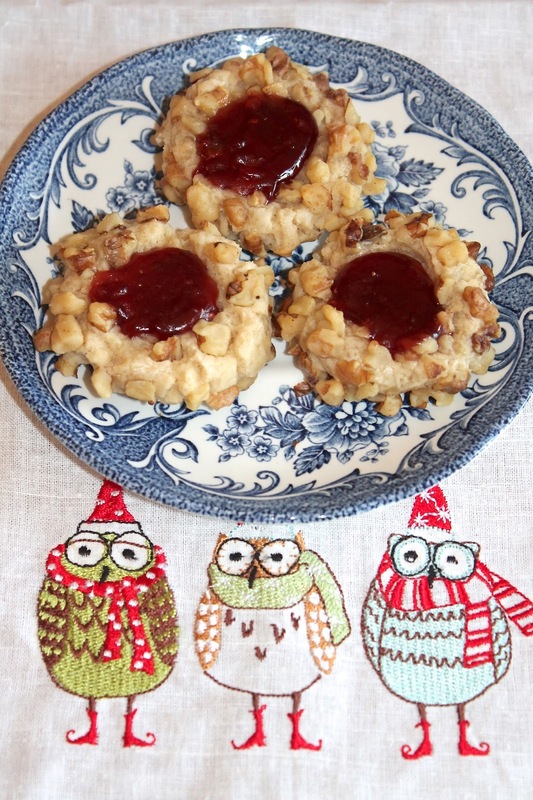 Give these cookies a try when you go out on your next autumn excursion. Here in the Buffalo area we have stuffed banana peppers on the menu at almost every pizza place, Italian type restaurant, or bar/pub in the area. I'm not sure if they are a local thing or what, but a Google search has led me to think that they aren't something that is very popular outside of the region. Basically, they are hot banana peppers stuffed with cheeses, Italian seasonings, sometimes sausage/pork, and the topped with breadcrumbs and baked til bubbly. They are delicious. Some places even have pizza versions and macaroni and cheese versions (I think I see both of these in the blog's future). But, this time around, I decided to take the flavors of these stuffed banana peppers and turn them into a thick and hearty soup. I used ground pork in this version, but you could use bulk Italian sausage, or just add a few more peppers and leave the meat out all together. Even though summer is holding on tight around here, I'm so ready for fall temperatures, fall foods, and everything else that comes along with my favorite season. Soup is one of my favorite things to make and eat when the weather turns cooler (though I've been know to make soup in the summer, too). 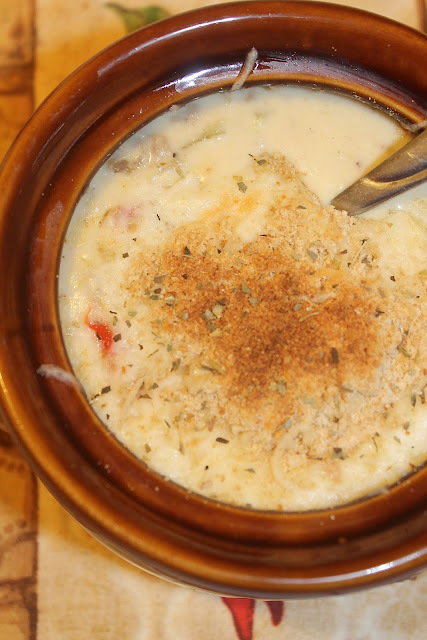 This soup will serve about 4 people as a main dish with a side of warmed crusty bread and butter. So it's been a little while since I've posted because I've been busy with our new twins. They were born a couple of weeks ago and things have been so very crazy. They and I are doing well (minus the general lack of sleep and exhaustion of taking care of - mostly feeding - two newborns). Sleeping, cooking, showering, etc. - these things are rare right now. I did happen to grab a few minutes through during a recent nap time to use up some zucchini our family brought us. Most of our food lately has consisted of cereal, sandwiches, pasta, and other things that are easy to consume. Even during pregnancy as it got really rough for me in the last couple months, I wasn't cooking a lot. So I'm hoping as the babies get more settled that this will change and I'll be back to cooking more frequently and easily. I miss the food! 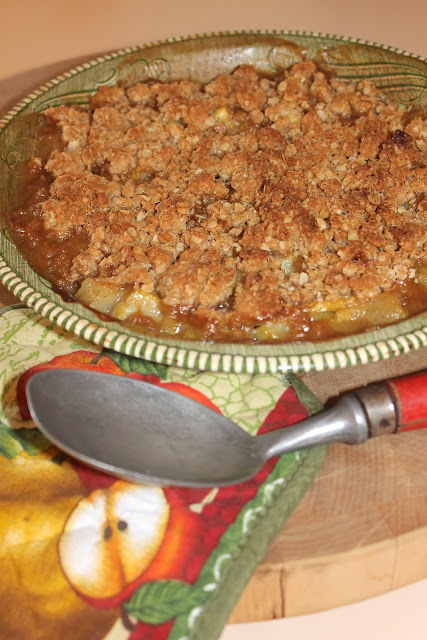 This crisp is often called "mock apple" crisp because the idea is you use zucchini in place of the apples in the filling for the crisp. I think that the zucchini still retains a texture and flavor that is "squashy" rather than "appley" - but, I do think that it works and still tastes really good. It's a terrific way to use up some zucchini if you are overflowing from your garden, or your neighbors or friends are dropping them off at your house. It almost made me feel like fall was here (except that it's 90 degrees here right now). It's time for July's Secret Recipe Club reveal. 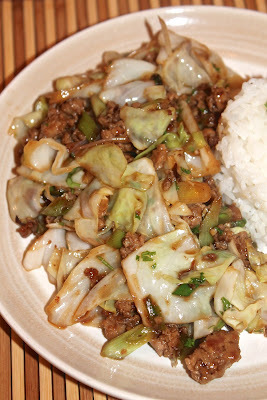 This month I was assigned the blog Sew You Think You Can Cook written by Lauren. Lauren lives way over near LA on the other side of the country from me! I was glad to be able to peruse her blog as it was another new one for me and I love to check out new food blogs. She has tons of terrific recipes. 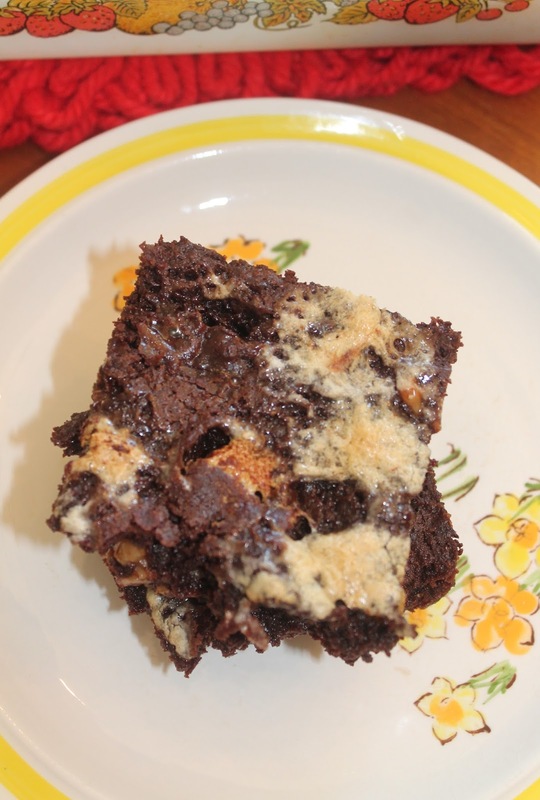 I was looking for a quick and easy dessert to make for a small picnic we had on the July 4th holiday weekend. I was originally going to make her Pink Lemonade Cupcakes because they sounded perfect for a summer treat. However, once I saw her Grandpa Ray's Grapefruit Pie, I changed my mind. 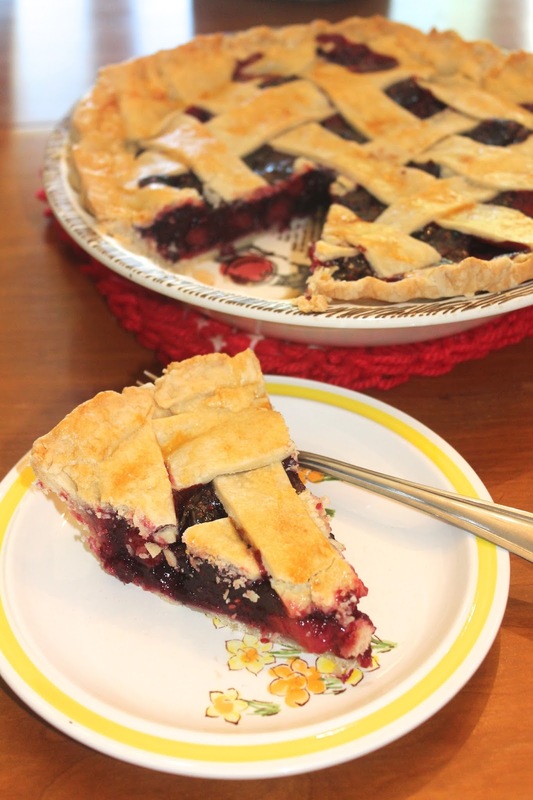 I think regular readers know my deep love of pie (I mean, I made 15 of them just last year). Plus this recipe looked so simple and would allow me to not be on my feet for too long (after this month, I'll be taking a maternity leave from Secret Recipe Club, but I hope to be back in October). This pie was completely unique and different from any pie I've ever tasted before. I happen to love grapefruit, but my husband is not a big fan. However, he still enjoyed this pie. Everyone commented on how they couldn't quite put their finger on the main ingredient, but knew it was something citrus. 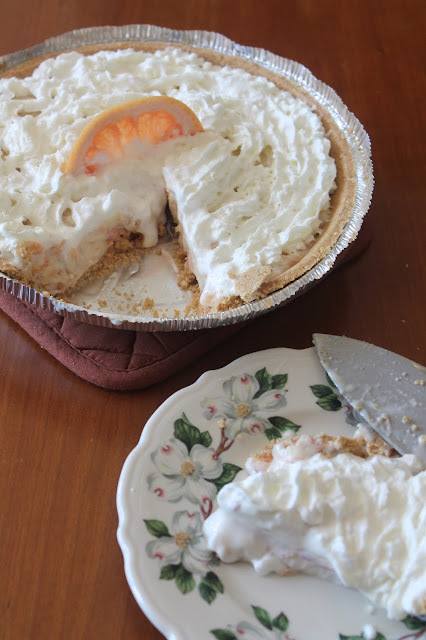 Plus, while I usually make homemade crusts and homemade whipped creams, this pie I used the store-bought shortcuts like in the recipe, which was terrific for me since my ankles have been the size of grapefruits lately! Easy meals are what I'm all about right now. Falutas are a favorite of mine since I started making them a couple years ago. The filling choices are endless. 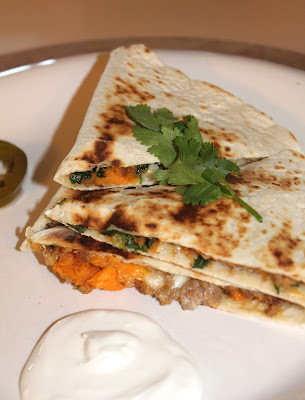 We've done beef filling similar to tacos, pinto beans and peppers, etc. 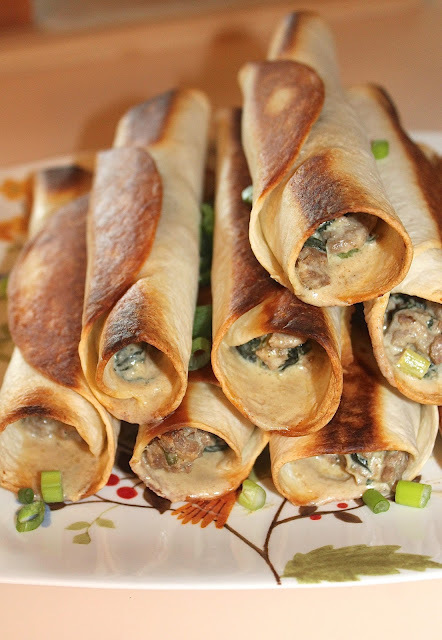 But, these creamy turkey and spinach ones seem to be the winner. The filling is simple to make. Then all you have to do is roll them up and give them a quick bake. Perfect for a weeknight dinner and they are sure to be popular in your house, too. Serve these falutas with a side of rice or beans or even some chips and salsa. We like to dip these falutas in salsa verde. Pickled jalapnenos on the side are also a nice touch. This recipe will make 8-10 falutas. Baby update: I am in the 34th week now (and measuring 43 weeks!) and the babies are looking great. It's so amazing to me that we've made it this far. I haven't shared all the struggles we've gone through, but suffice it to say that these babies have been a long-time coming. We are so excited to meet them. Twins are considered "full-term" at 37 weeks and we are at the point now where they could really come anytime. We're hoping to keep them growing until at least 36 weeks though. Stay tuned! Say what? I'm making and posting a winter squash recipe in April?! Well, yes, yes I am.... We still have a few lingering in basement storage that we are finishing up before it becomes summer squash season. So while it may be a little out-of-season right now, just save this spaghetti squash recipe for this coming fall/winter. It's one you will definitely want to give a try! It's cheesy, with hints of onion and garlic flavor. It's like a mac n' cheese, but with spaghetti squash instead of noodles. We ate this as a side dish to a grilled ham steak with a honey-mustard sauce. Speaking of grilling, I am super excited that the warmer weather is coming and also that when we moved into our new house that the previous owners left us their grill! We've already been using it and loving it. I made this recipe with a smaller spaghetti squash and it would make a side dish for about 3-4 people. It's time for April's Secret Recipe Club Reveal. This month I was assigned to make a recipe from The Avid Appetite. This blog is written by Rachel from New Jersey. Her blog started out as mostly a food and recipe blog but now has expanded to include all aspects of her life. There were a lot of recipes that caught my eye like her Gingerbread Coffee Syrup and Pineapple Chicken with Couscous. 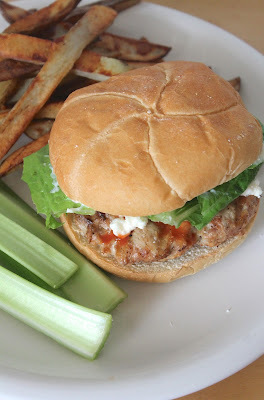 But, being a Buffalo girl, I decided that I wanted to give her Buffalo Chicken Burgers a try. At first I wasn't sure I'd be able to make them because I couldn't find any blue cheese made with pasteurized milk (raw cheese is currently on my can't eat list). But I finally found some at Aldi! What I especially liked about her burgers was that she used the correct hot sauce (gotta be Frank's) and blue cheese (I love ranch as much as the next person, but it doesn't belong on anything called "Buffalo") - so I knew these burgers would be winners! I was right. They were delicious and full of that Buffalo chicken wing flavor. I slightly modified April's recipe and my version is below. This recipe will make four burgers. I served them with celery sticks and oven fries. It's time for another edition of Secret Recipe Club. This month I was assigned Angels Home Sweet Homestead written by April who writes about homesteading, cooking, and gardening on a budget. All topics that I love (especially the budget part)! Normally when I'm looking through someone's blog to pick a recipe it takes me a while, but this time as soon as I saw Chicken Fried Chicken and her gravy recipe, I knew I wasn't going to find anything that I wanted to make more than that!! I have only ever had this dish in a restaurant and was super excited to try making it at home (and my husband was super excited to eat it). We loved it! It turned out light, crispy, and perfectly golden. 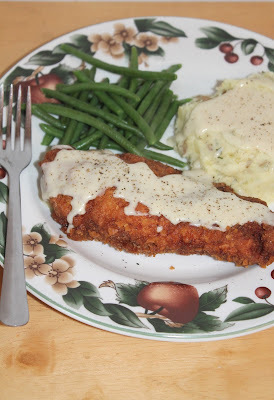 Served with mashed potatoes and green beans, it was the perfect chilly night meal - total comfort food. Next time though, I'm giving her Fluffy Southern Buttermilk Biscuits a try! I made only half the chicken recipe for us, but I'm posting April's recipe below. If you make the full recipe you will feed a crowd! I slightly modified her gravy recipe. This is a dish you should definitely try. My posts have been sparse the past few months. Moving was a big part of that, but this post will provide a bigger explanation for my absence. Life has been crazy lately and it's only going to get crazier, but in a really amazing way! After many years of struggles and loss and heartache, my husband and I are expecting twins this summer and we couldn't be more thrilled and excited! The past few months I struggled with all-day "morning" sickness and couldn't even stand the smell of most food cooking, so blogging was tough! Now that phase is behind me and all I want to do is eat (and sleep)! 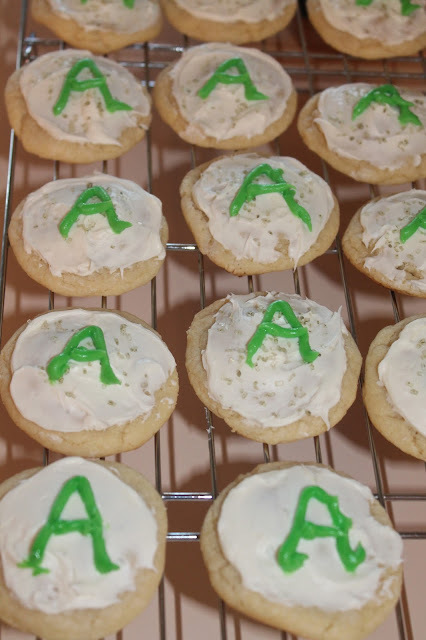 I made these cookies for a surprise treat recently at an open house we had for our family to come see our new home. The pregnancy is considered high-risk, but we are almost halfway there and very hopeful and looking forward to their safe arrival. Cookies for "Baby A" and cookies for "Baby B." 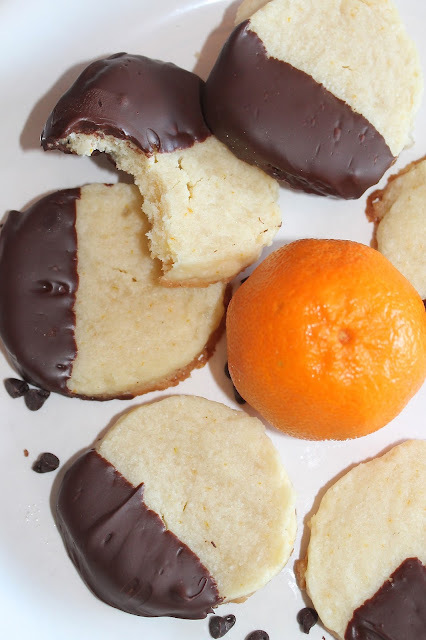 I modified this recipe to make these cookies to share for a surprise "gender reveal." They turned out just as I was imagining so I was very happy. We gave everyone an "A" cookie and had everyone bite on the count of three and then did the same with the "B" cookies. The below recipe made just over 2 dozen cookies. I was super excited to see that I was assigned Living the Gourmet for this month's Secret Recipe Club! I have followed this blog for quite a while now and I knew I'd have a hard time picking just one recipe I wanted to try. Catherine and Tammy always post such lovely and tasty recipes. 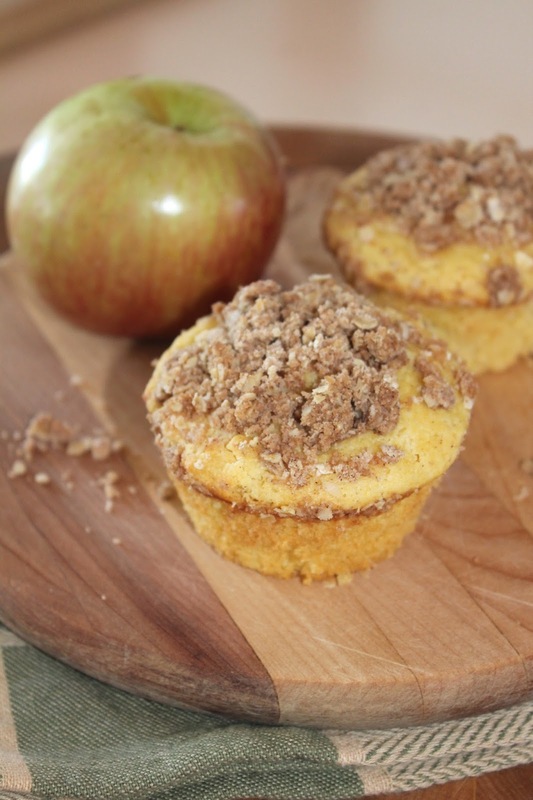 When it came down to a final selection, I chose these Apple Cornmeal Muffins because we've been having negative wind chills here recently -- I wanted a warm and cozy baking recipe that was perfect for breakfast and snacking with coffee and tea. I liked that these muffins were low in sugar which also made them nice for breakfast. 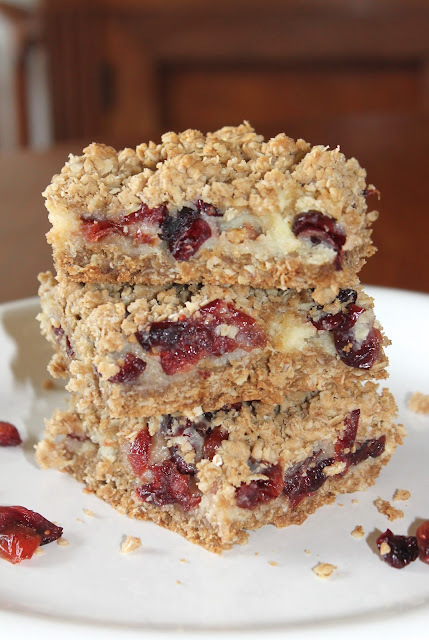 They turned out lovely and were a definite hit (plus we can never resist anything with a streusel on top)! This recipe will make a dozen muffins. Check out the links below to see more recipes from The Secret Recipe Club.